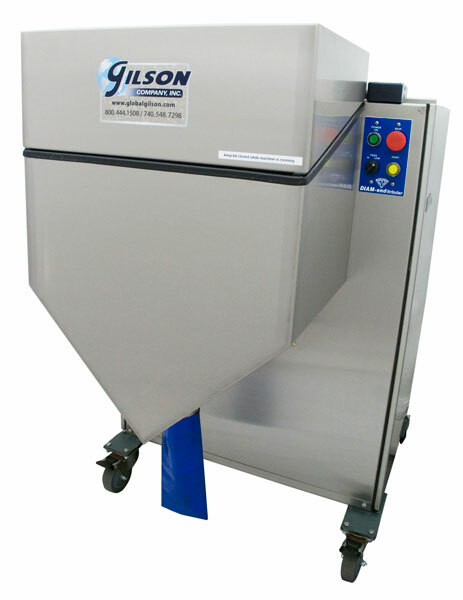 Concrete Cylinder End Grinders (4" or 6" Cylinders) - Gilson Co. The HM-714A and 716A Concrete Cylinder End Grinders are multi-sample preparation units which eliminate the need for qualification testing or documentation of common capping methods. End-grinding is the preferred end-preparation method for concrete samples with design strengths exceeding 7,000psi (48.3mPa). They also eliminate time-consuming and labor-intensive sulfur capping, and reduce dust and health hazards, and other safety concerns. The Concrete Cylinder End Grinder can also correct cylinders with damaged or poorly finished ends that would otherwise be unusable for testing; it is ideal for large laboratories with heavy daily sample volumes. Once the cylinders are mounted in the carousel and the grinding cycle starts, the operation becomes fully automated, freeing technicians to perform other duties during grinding. The grinder operates until a preset 4mm of material has been removed from each sample, polishes the cylinder ends, then automatically shuts down. The included water tank and pump circulates water to the diamond grinding head for cooling and flushing of cuttings. HM-714A Concrete Cylinder End Grinder is equipped to handle up to six 4in (102mm) cylinders in each cycle, and is recommended when only 4in diameter specimens are tested. HM-716A Concrete Cylinder End Grinder accommodates four 6in (152mm) diameter test cylinders, and includes adapters to accept four 4in (102mm) cylinders. The unit may only be operated with one size cylinder at a time, and is recommended in labs where both 4 and 6in specimen sizes are tested. The optional HMA-1054 Carousel can be fitted to this unit to allow grinding of six 4in diameter cylinders only.